The United States has attempted to claim that the only way to stop the so-called “Islamic State” in Syria and Iraq is to first remove the government in Syria. Complicating this plan are developments in Libya, benefactor of NATO’s last successful regime change campaign. In 2011, NATO armed, funded, and backed with a sweeping air campaign militants in Libya centered around the eastern Libyan cities of Tobruk, Derna, and Benghazi. By October 2011, NATO successfully destroyed the Libyan government, effectively handing the nation over to these militants. What ensued was a campaign of barbarism, genocide, and sectarian extremism as brutal in reality as what NATO claimed in fiction was perpetrated by the Libyan government ahead of its intervention. The so-called “rebels” NATO had backed were revealed to be terrorists led by Al Qaeda factions including the Libyan Islamic Fighting Group (LIFG) and Al-Qaeda in the Islamic Maghreb (AQIM). The so-called “pro-democracy protesters” Libyan leader Muammar Qaddafi was poised to attack in what NATO claimed was pending “genocide” were in fact heavily armed terrorists that have festered for decades in eastern Libya.Almost immediately after NATO successfully destroyed Libya’s government, its terrorist proxies were mobilized to take part in NATO’s next campaign against Syria. Libyan terrorists were sent first to NATO-member Turkey where they were staged, armed, trained, and equipped, before crossing the Turkish-Syrian border to take part in the fighting. Images: Same convoy, different flag. Even in 2011, it was painfully obvious the so-called “rebels” fighting with NATO assistance in Libya were in fact members of long-standing Al Qaeda franchises including the Libyan Islamic Fighting Group (LIFG) and Al Qaeda in the Islamic Maghreb (AQIM). Their strongholds in eastern Libya served as the “revolution’s” cradle, meaning the “revolution” was merely cover for a NATO-assisted Al Qaeda uprising. In other words, NATO handed Libya over to Al Qaeda, and is attempting to do likewise with Syria. Fighters loyal to the Islamic State in Iraq and Syria are now in complete control of the city of Derna, population of about 100,000, not far from the Egyptian border and just about 200 miles from the southern shores of the European Union. The fighters are taking advantage of political chaos to rapidly expand their presence westwards along the coast, Libyan sources tell CNN. Only the black flag of Al Qaeda/ISIS has already long been flying over Libya – even at the height of NATO’s intervention there in 2011. ISIS didn’t “come to” Libya, it was always there in the form of Al Qaeda’s local franchises LIFG and AQIM – long-term, bitter enemies of the now deposed and assassinated Libyan leader Muammar Qaddafi. 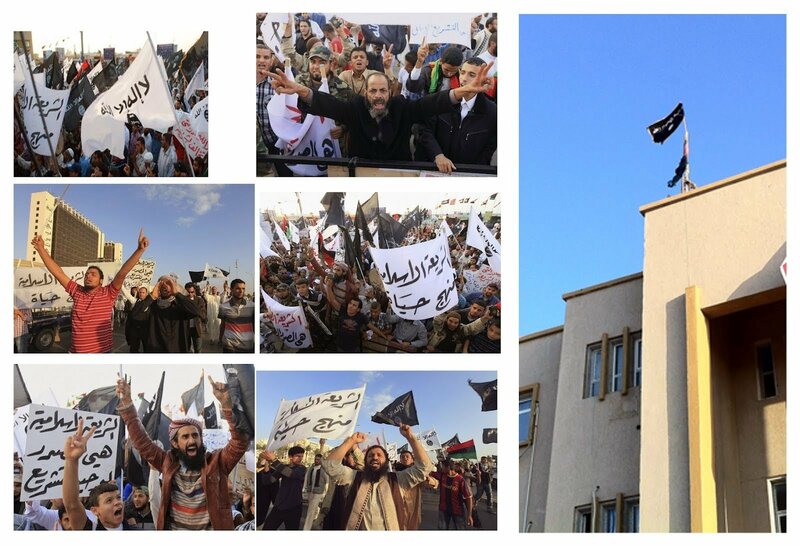 Images: While CNN claims the “black flag of ISIS” is just now flying over Libya, in reality, the black flag of Al Qaeda and US-Saudi funded global terrorism has flown over Libya for years. Just weeks after US Senator John McCain was in the terrorist capital of Benghazi pledging funds and weapons to the militants, overt public demonstrations in support for Al Qaeda took place right on the doorsteps of the courthouse McCain appeared at. CNN’s latest article is merely the veneer finally peeling away from the alleged “revolution” it had attempted to convince readers had taken place in 2011. Even amid CNN’s own spin, it admits ISIS’ presence in Libya is not a new phenomenon but rather the above mentioned sectarian extremists who left Libya to fight in Syria simply returning and reasserting themselves in the eastern Cyrenaica region. CNN also admits that these terrorists have existed in Libya for decades and were kept in check primarily by Libyan leader Muammar Qaddafi. With Qaddafi eliminated and all semblance of national unity destroyed by NATO’s intervention in 2011, Al Qaeda has been able to not only prosper in Libya but use the decimated nation as a spingboard for invading and destroying other nations. 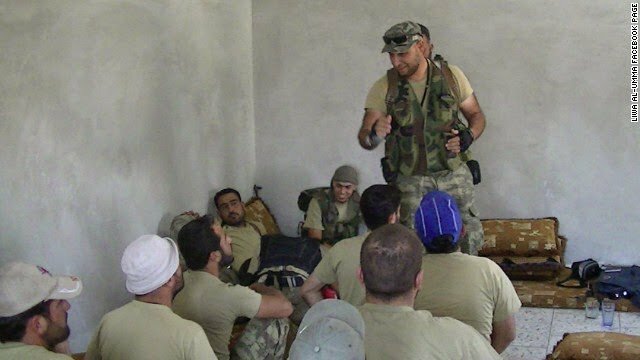 Image: Libyan Mahdi al-Harati of the Al Qaeda affiliate LIFG, leading Libyan terrorists in Syria. LIFG terrorists would pass through NATO territory in Turkey on their way to Syria’s border. 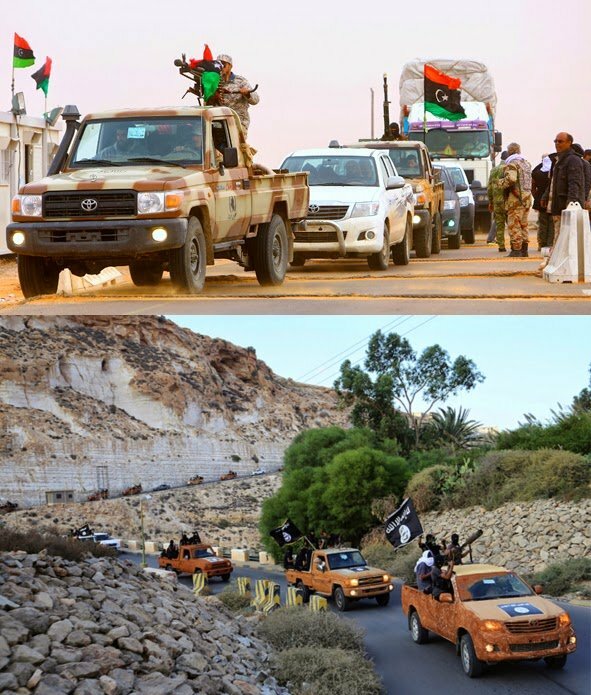 ISIS “coming to” Libya is simply LIFG terrorists returning from their NATO-backed expeditionary mission. Worst of all, Al Qaeda’s rise in Libya was not merely the unintended consequence of a poorly conceived plan by NATO for military intervention, but a premeditated regional campaign to first build up then use Al Qaeda as a mercenary force to overthrow and destroy a series of nations, beginning with Libya, moving across North Africa and into nations like Egypt, Syria, Lebanon, Iraq, and eventually Iran. From there, NATO’s mercenary force would be on the borders of Russia and China ready to augment already Western-backed extremists in the Caucasus and Xinjiang regions. …use Al Qaeda to overthrow independent governments, and then either Balkanize and partition the countries in question, or else use them as kamikaze puppets against larger enemies like Russia, China, or Iran. In fact, terrorist fighters from northeast Libya may be killing US and NATO troops in Afghanistan right now, even as the US and NATO protect their home base from the Qaddafi government. Indeed, the very terrorists NATO handed the entire nation of Libya over to, are now allegedly prime targets in Syria and Iraq. The “pro-democracy rebels” of 2011 are now revealed to be “ISIS terrorists” with long-standing ties to Al Qaeda. Not even mentioning the fact that Al Qaeda’s very inception was to serve as a joint US-Saudi mercenary force to fight a proxy war in Afghanistan against the Soviet Union, the terrorist organization has since played a central role in the Balkans to justify NATO intervention there, and as a divisive force in Iraq during the US occupation to blunt what began as a formidable joint Sunni-Shia’a resistance movement. In 2007, it was revealed by Pulitzer Prize-winning veteran journalist Seymour Hersh that the United States, Israel, and Saudi Arabia were conspiring to use Al Qaeda once again, this time to undermine, destabilize, and destroy the governments of Syria and Iran in what would be a regional sectarian bloodbath. Hersh would note that Iran was perceived to be the greater threat and therefore, despite a constant barrage of propaganda claiming otherwise, Al Qaeda and its various affiliates were “lesser enemies.” Even in 2007, Hersh’s report would predict almost verbatim the cataclysmic regional sectarian bloodbath that would take place, with the West’s extremists waging war not only on Shia’a populations but also on other religious minorities including Christians. And this is precisely what is happening, word for word, page by page – everything warned about in Hersh’s report has come to pass. In 2011, geopolitical analyst Dr. Webster Tarpley and others would also reiterate the insidious regional campaign Western policymakers were carrying out with Al Qaeda terrorists disguised as “rebels,” “activists,” and “moderate fighters” for the purpose of arming, funding, and even militarily intervening on their behalf in attempts to effect regime change and tilt the balance in the Middle East and North Africa region against Iran, Russia, and China. CNN’s attempt to explain why ISIS is “suddenly” in Libya is one of many attempts to explain the regional rise of this organization in every way possible besides in terms of the truth – that ISIS is the result of multinational state sponsored terrorism including the US, UK, EU, Turkey, Jordan, Saudi Arabia, Qatar, and Israel as its chief backers. President Barack Obama has asked his national security team for another review of the U.S. policy toward Syria after realizing that ISIS may not be defeated without a political transition in Syria and the removal of President Bashar al-Assad, senior U.S. officials and diplomats tell CNN. Neither CNN, nor the politicians it cited in its article were able to articulate just why removing Syrian President Bashar al-Assad from power would somehow diminish the fighting capacity of ISIS. With CNN’s recent article on ISIS’ gains in Libya despite US-led NATO regime change there, after decades of Libyan leader Qaddafi keeping extremists in check, it would appear that NATO is once again attempting not to stop Al Qaeda/ISIS, but rather hand them yet another country to use as a base of operations. The goal is not to stop ISIS or even effect regime change in Syria alone – but rather hand Syria over as a failed, divided state to terrorists to use as a springboard against Iran, then Russia and China. Clearly, ISIS’ appearance in Libya negates entirely the already incomprehensible strategy the US has proposed of needing to first depose the Syrian government, then fight ISIS. The Syrian government, like that of Libyan leader Muammar Qaddafi, is the only effective force currently fighting ISIS and Al Qaeda’s many other franchises operating in the region. Deposing the government in Damascus would compound the fight against sectarian terrorists – and the West is fully aware of that. Therefore, attempts to topple the secular government in Damascus is in every way the intentional aiding and abetting of ISIS and the sharing in complicity of all the horrific daily atrocities ISIS and its affiliates are carrying out. The morally bankrupt, insidious, dangerous, and very genocidal plans hatched in 2007 and executed in earnest in 2011 illustrate that ISIS alone is not the greatest threat to global peace and stability, but also those that constitute its multinational state sponsors. The very West purportedly defending civilization is the chief protagonist destroying it worldwide.